This type of search is usually of interest to the police or security services. GPR is one of the tools which can be used in forensic searches whether these are for illegally held weapons or for illicit burials. The technology is particularly useful where the search has to be conducted through man-made materials, for example through walls, under patios, beneath tarmac. It can however be used on any surface. Since data can be collected continuously even over open ground it can be a rapid method of searching. Buried bodies are usually searched for within days of a person’s disappearance. However, it also happens that recently discovered evidence requires a search for someone who disappeared years ago. GPR detection depends on electromagnetic differences between the body and the surrounding soil or other material. With a recent decease, these differences are marked. Over time, the differences may decrease and a great deal depends on how the burial was made. If you need to know more or have our advice, please get in touch. What Frequency of Antenna? What Radar? Working outdoors normally requires a mid-range antenna such as 400MHz or 250MHz both of which are options for Groundvue 3. They can be used on a trolley if the ground is suitable, hand towed if it is too rough for the trolley or suspended below or towed by a vehicle where ground conditions permit. If the target is small, it is possible to use a high frequency antenna such as the 1GHz. The image below is a horizontal plan (time slice) of an outdoor search area where the target is a buried weapon. 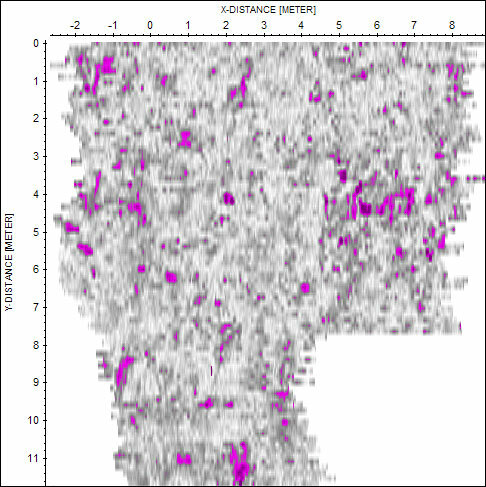 The pink areas indicate the potential points of interest where strong signal returns indicate the presence of anomalous material which could be anything significantly different from the soil. Some of these can be eliminated on the grounds of size, the rest are investigated by digging to find the target. Looking for concealed weapons in buildings, under concrete or concealed behind door panels requires a very high frequency radar such as the 4GHz Groundvue 5. The picture below shows a vertical plan (time slice) of two batons concealed behind a door panel. The darker image indicates that one is made of metal. See also Specialist Tools for internal wall inspections. 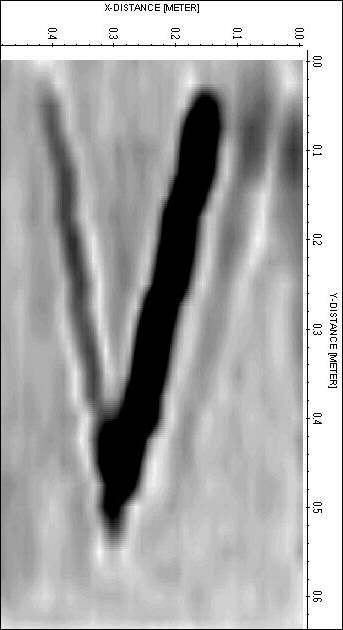 The European GPR Association forensic search guidelines for GPR are available on www.eurogpr.org.